First published on GirlsGetaway.com, Feb. 27, 2012; updated Feb. 20, 2013. 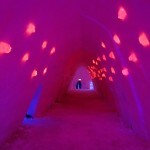 I remember the first time I’d heard of a snow hotel and an ice bar, first built in Sweden in 1990. “How cool,” I thought. And for this sun – and warm weather-loving girl, what a novel idea! 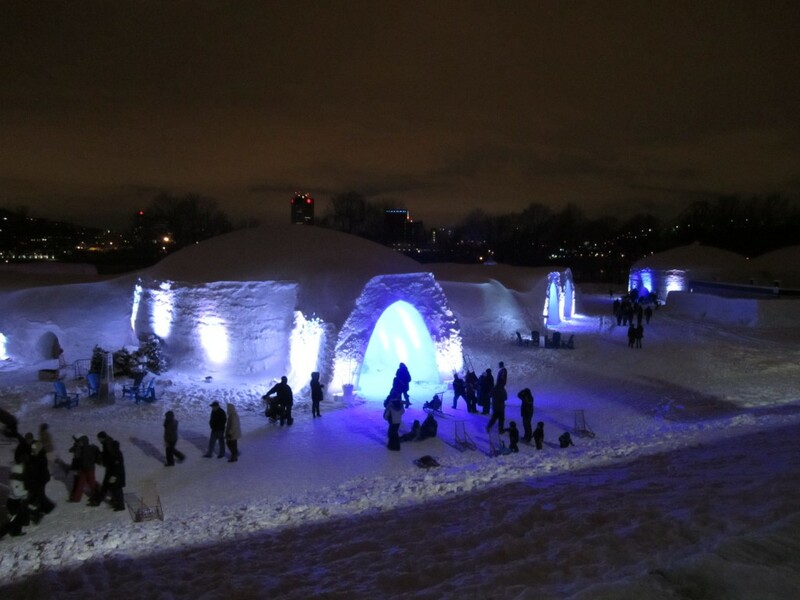 I recently had the chance to visit the Snow Village in Montreal – North America’s first. Cool, indeed! 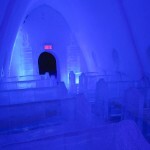 Montreal’s Snow Village is made up of 15 standard hotel rooms, 10 prestige suites, igloos, a chapel (three weddings were held last year! 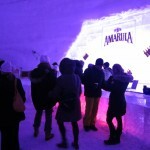 ), an ice bar, and even a restaurant. 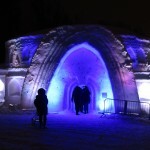 All of the buildings are constructed of snow firmly packed over wooden frames, with nine-foot walls lit with colorful LED lights to lead the way. 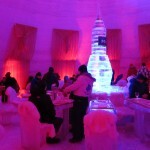 All furniture – beds, chairs, tables, sofas – are carved from ice, and ornate ice and snow sculptures adorn the walls. Fur pelts are strewn across beds, chairs and sofas, providing a bit of protection from the eminent cold. 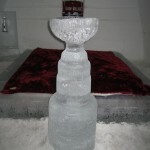 Each overnight room has its own theme, be it the four seasons with real flowers encased in ice, or a hockey-themed room with a life-size ice carving of the Stanley Cup, just to name a few. One room has four beds, perfect for your next girlfriend getaway! Want to take a look for yourself? Every night it’s open, visitors are welcome to tour the village, peek into the rooms, say a small prayer in the chapel (perhaps for warmth in your toes?) 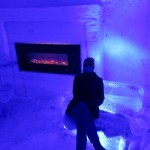 and have a drink in the ice bar. Dinner reservations are accepted in the restaurant, and you may be surprised to find a room full of fellow inquisitive diners. 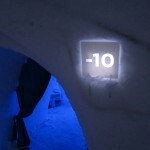 When guests check in for the night, they’re given a thermal sleeping bag. At bedtime, they’ll cozy up inside and hibernate for the night. Planning accordingly is a necessity, though – bathrooms are outside, and they’ll need to get fully dressed to use the facilities! 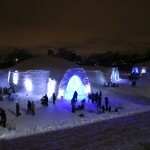 Whichever you decide – an overnight stay or a quick visit – make some time to chill in Montreal’s Snow Village. You’ll have to hurry though – the village melts away at the end of March!